When you’ve been involved in a car crash, the auto accident injuries resulting from the incident may not always have a physical cause. The emotional distress due to trauma or injury from the impact of an automobile accident may often be so immense, it can lead to a variety of painful symptoms. If such stress is not treated immediately, it could result in the development of psychological conditions. Stress, anxiety, depression and in severe cases, PTSD, or post traumatic stress disorder, are some of the most common psychological issues you may end up encountering after a traumatic auto accident. In several cases, the victim of an automobile accident may develop irrational fears as a result of the incident. As a matter of fact, many of these individuals report experiencing anxiety about getting behind the wheel again. For them, the fear of being in another accident may ultimately cause them to avoid driving altogether. For many other individuals still, the irrational fear of suffering a panic attack while on the road may be the cause for them to avert driving entirely. If the anxiety and irrational fears caused by the emotional distress of an auto accident worsen, it may permanently discourage a person from driving again. 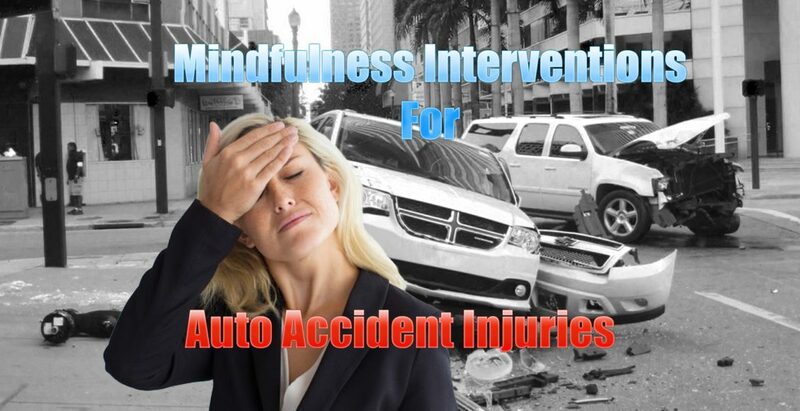 It is also possible for people who’ve been involved in an auto accident to develop depression following the incident. In the end, you wind up experiencing psychological trauma as a result of physical trauma. There are numerous symptoms of depression which you might readily recognize. These include problems with sleep, losing your appetite, and headaches. As it becomes worse, however, you might end up feeling sad or hopeless all of the time, which could lead to worsening symptoms. It’s highly possible for individuals involved in an automobile accident to suffer from post traumatic stress disorder, or PTSD. According to the National Center For PTSD, as much as 9 percent of people who experience auto accident injuries end up suffering from PTSD. Moreover, at least 14 percent of car crash survivors who seek mental health care are experiencing PTSD. A new research study demonstrated that mindfulness interventions might be just as essential to your health as traditional treatment, especially if you’ve got post traumatic stress disorder, or PTSD. Researchers have demonstrated that chiropractic care can lead to a substantial advancement in the mind-body stress component of a patient’s overall health and wellness. Addressing automobile accident injuries, such as whiplash, which also result in anxiety and irrational fears, depression and especially PTSD, demands a multi-disciplinary strategy. Chiropractic is an alternative treatment option which focuses on injuries and/or conditions of the musculoskeletal and nervous system. A chiropractor commonly utilizes spinal adjustments and manual manipulations to carefully correct spinal misalignments, or subluxations, which could be causing pain and discomfort. By releasing pressure and muscle tension, a doctor of chiropractic, or chiropractor, can help reduce stress and emotional distress which could be causing the individual’s anxiety, irrational fears, depression and PTSD. If further help is required, the chiropractor can recommend patients to the best healthcare specialist to help them with their symptoms. 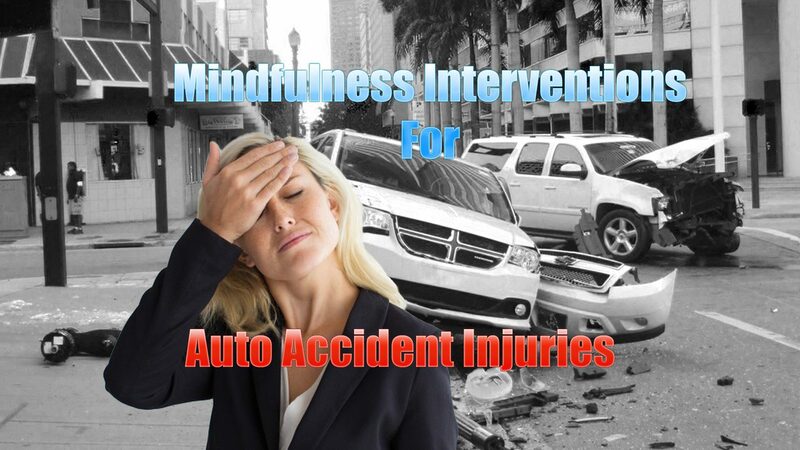 The purpose of the following article is to demonstrate the prevalence of PTSD on individuals involved in a traffic collision as well as to show how mindfulness interventions can ultimately help improve as well as manage the stress symptoms people may experience after a car crash. Road traffic accidents often cause serious physical and psychological sequelae. Specialists of various medical faculties are involved in the treatment of accident victims. Little is known about the factors which might predict psychiatric disorders, e.g. Posttraumatic Stress Disorder (PTSD) after accidents and how psychological problems influence physical treatment. In a prospective study 179 unselected, consecutively admitted road traffic accident victims were assessed a few days after the accident for psychiatric diagnoses, severity of injury and psychopathology. All were inpatients and had to be treated for bone fractures. At 6-months follow-up assessment 152 (85%) of the patients were interviewed again. Of the patients, 18.4% fulfilled the criteria for Posttraumatic Stress Disorder (DSM-III-R) within 6 months after the accident. Patients who developed PTSD were injured more severely and showed more symptoms of anxiety, depression and PTSD a few days after the accident than patients with no psychiatric diagnosis. Patients with PTSD stayed significantly longer in the hospital than the other patients. Multiple regression analysis revealed that the length of hospitalization was due mainly to a diversity of factors such as severity of injury, severity of accident, premorbid personality and psychopathology. Posttraumatic stress disorder is common after road traffic accidents. Patients with PTSD at follow-up can be identified by findings from early assessment. Untreated psychological sequelae such as PTSD cause longer hospitalization and therefore more costs than in non-PTSD patients. Introduction: As a consequence of a road traffic crash, persistent pain and disability following whiplash injury are common and incur substantial personal and economic costs. Up to 50% of people who experience a whiplash injury will never fully recover and up to 30% will remain moderately to severely disabled by the condition. The reason as to why symptoms persist past the acute to sub-acute stage and become chronic is unclear, but likely results from complex interactions between structural injury, physical impairments, and psychological and psychosocial factors. Psychological responses related to the traumatic event itself are becoming an increasingly recognised factor in the whiplash condition. Despite this recognition, there is limited knowledge regarding the effectiveness of psychological interventions, either delivered alone or in combination with physiotherapy, in reducing the physical and pain-related psychological factors of chronic whiplash. Pilot study results have shown positive results for the use of trauma-focused cognitive behaviour therapy to treat psychological factors, pain and disability in individuals with chronic whiplash. The results have indicated that a combined approach could not only reduce psychological symptoms, but also pain and disability. Aims: The primary aim of this randomised, controlled trial is to investigate the effectiveness of combined trauma-focused cognitive behavioural therapy, delivered by a psychologist, and physiotherapy exercise to decrease pain and disability of individuals with chronic whiplash and post-traumatic stress disorder (PTSD). The trial also aims to investigate the effectiveness of the combined therapy in decreasing post-traumatic stress symptoms, anxiety and depression. Participants and Setting: A total of 108 participants with chronic whiplash-associated disorder (WAD) grade II of > 3 months and < 5 years duration and PTSD (diagnosed with the Clinician Administered PTSD Scale (CAPS) according to the DSM-5) will be recruited for the study. Participants will be assessed via phone screening and in person at a university research laboratory. Interventions will take place in southeast Queensland, Australia and southern Denmark. Intervention: Psychological therapy will be delivered once a week over 10 weeks, with participants randomly assigned to either trauma-focused cognitive behavioural therapy or supportive therapy, both delivered by a clinical psychologist. Participants will then receive ten sessions of evidence-based physiotherapy exercise delivered over a 6-week period. Outcome Measures: The primary outcome measure is neck disability (Neck Disability Index). Secondary outcomes focus on: pain intensity; presence and severity of PTSD (CAPS V and PTSD Checklist 5); psychological distress (Depression, Anxiety Stress Scale 21); patient perceived functionality (SF-12, Tampa Scale of Kinesiophobia, and Patient-Specific Functional Scale); and pain-specific self-efficacy and catastrophising (Pain Self-Efficacy Questionnaire and Pain Catastrophizing Scale). After psychotherapy (10 weeks after randomisation) and physiotherapy (16 weeks after randomisation), as well as at the 6-month and 12-month follow-ups, a blind assessor will measure the outcomes. Analysis: All analyses will be conducted on an intention-to-treat basis. The primary and secondary outcomes that are measured will be analysed using linear mixed and logistic regression models. Any effect of site (Australia or Denmark) will be evaluated by including a site-by-treatment group-by-time interaction term in the mixed models analyses. Effect modification will only be assessed for the primary outcome of the Neck Disability Index. Discussion: This study will provide a definitive evaluation of the effects of adding trauma-focused cognitive behaviour therapy to physiotherapy exercise for individuals with chronic WAD and PTSD. This study is likely to influence the clinical management of whiplash injury and will have immediate clinical applicability in Australia, Denmark and the wider international community. The study will also have implications for both health and insurance policy makers in their decision-making regarding treatment options and funding. Persistent pain and disability following whiplash injury as a consequence of a road traffic crash (RTC) is common and incurs substantial personal and economic costs. Up to 50% of people who experience a whiplash injury will never fully recover and up to 30% will remain moderately to severely disabled by the condition [1-3]. Less recognised are the mental health issues that accompany this condition. The prevalence of psychiatric disorders has been shown to be 25% for PTSD, 31% for Major Depressive Episode and 20% for Generalised Anxiety Disorder [4-6]. Whiplash injury accounts for the vast majority of any submitted claims as well as the greatest incurred costs in Queensland compulsory third party scheme . In Australia, Whiplash injuries comprise approximately 75% of all survivable RTC injuries  with total costs of more than $950 M per annum , exceeding costs for both spinal cord and traumatic brain injury . In Denmark, whiplash costs an estimated 300 million USD per annum if loss of work is included . Neck pain is the cardinal symptom of individuals following whiplash injury. It is now generally accepted that there is an initial peripheral injury of some kind to the neck  although the specific injured structure in individual patients is difficult to clinically identify with current imaging techniques. The reason as to why symptoms persist past the acute to sub-acute stage and become chronic is not clear but likely results from complex interactions between structural injury, physical impairments, psychological and psychosocial factors . However it is clear that chronic WAD is a heterogeneous and complex condition involving physical impairments such as movement loss, disturbed movement patterns and sensory disturbances  as well as pain related psychological responses such as catastrophizing [14, 15], kinesiophobia , activity avoidance and poor self-efficacy for pain control . In addition recent studies have shown that posttraumatic stress symptoms or event related distress is common [18-20]. Thus it would seem logical that interventions targeting both the physical and psychological manifestations of the whiplash condition would be of benefit. In contrast to many common musculoskeletal pain conditions (e.g. low back pain, non-specific neck pain) whiplash related neck pain usually occurs following a traumatic event, namely a motor vehicle crash. Psychological responses related to the traumatic event itself, posttraumatic stress symptoms, are emerging as an important additional psychological factor in the whiplash condition. Recent data indicates that post-traumatic stress symptoms are prevalent in individuals who have sustained whiplash injuries following motor vehicle accidents [18, 20, 21]. The early presence of posttraumatic stress symptoms have been shown to be associated with poor functional recovery from the injury [13, 18]. Recent data from our laboratory have shown that following whiplash injury 17% of individuals will follow a trajectory of initial moderate/severe posttraumatic stress symptoms that persist for at least 12 months and 43% will follow a trajectory of moderate initial symptoms that decrease but remain at mild to moderate (sub-clinical) levels for at least 12 months (the duration of the study) . See Figure 1. These figures are significant as they are similar to the prevalence of PTSD in individuals admitted to hospital following ‘more severe’ motor vehicle injuries . Figure 1: Data from 155 whiplash injured participants measured at 1, 3, 6 & 12 months post-accident. The Posttraumatic Stress Diagnostic Scale (PDS) was measured at each time point. Group based trajectory modelling identified 3 distinct clinical pathways (trajectories). 1. Chronic moderate/severe (17%) 2. 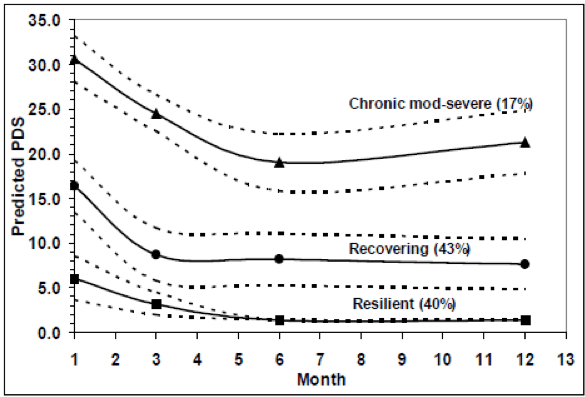 Recovering: initial moderate levels of posttraumatic stress decreasing to mild/ moderate levels. 3. Resilient: negligible symptoms throughout2. PDS symptom score Cut-offs: 1–10 mild, 11–20 moderate, 21–35. Although chronic WAD is a considerable health problem the number of published randomized controlled trials (RCTs) is very limited . A recent systematic review concluded that there is evidence to suggest that exercise programs are modestly effective in relieving whiplash-related pain, at least over the short term . For example, Stewart et al  showed only a 2 point (on a 10 point scale) decrease in pain levels immediately after a 6 week functional exercise management intervention that adhered to pain-related CBT principals but with no significant sustained effects at more long term follow-ups of 6 and 12 months. In a preliminary RCT conducted in our laboratory (published in 2007), a more neck specific exercise approach also delivered only modest effects, in that pain and disability scores decreased by just clinically relevant amounts (8±14% on the Neck disability Index) when compared to a single advice session . The systematic review also concluded that there is conflicting evidence regarding the effectiveness of psychological interventions either delivered alone or in combination with physiotherapy . The studies included in the review were of variable quality and mostly utilized CBT in some format to address pain related cognitions and distress [26, 27]. No study specifically targeted PTSD symptoms. Thus the seemingly logical proposal of interventions to target the physical and pain–related psychological factors of chronic WAD is not working as well as would be anticipated. This expectation is based on more favourable outcomes with such approaches for other musculoskeletal pain conditions such as low back . In an endeavour to understand why exercise rehabilitation approaches are not very effective for chronic WAD, we undertook a NHMRC (570884) funded randomized controlled trial that included effect modifiers of PTSD symptoms and sensory disturbances. In this larger (n=186) multicentre trial, preliminary analysis indicate that only 30% of patients with chronic WAD and a PTSD diagnosis had a clinically relevant change in Neck Disability Index scores (>10% change) compared to 70% of WAD patients without PTSD following an exercise rehabilitation program. All included participants reported moderate or greater levels of pain and disability indicating that the co-morbid presence of PTSD prevents a good response to physical rehabilitation. We could find no modifying effect of any sensory changes. The results of this study lead us to propose that first treating PTSD and then instituting physical rehabilitation will be a more effective intervention to improve health outcomes for chronic WAD. Trauma-focused CBT is a highly effective treatment for PTSD symptoms  and the Australian Guidelines for Treatment of Acute Stress Disorder and PTSD recommend that individually delivered trauma-focused CBT should be provided to people with these conditions . There is data available to indicate that trauma-focused CBT may potentially have an effect not only on PTSD symptoms but also on pain and disability. The results of a recent empirical examination explored directional relationships between PTSD and chronic pain in 323 survivors of accidents . The results indicated a mutual maintenance of pain intensity and posttraumatic stress symptoms at 5 days post injury but by 6 months post injury (chronic stage), PTSD symptoms impacted significantly on pain but not vice versa. Whilst this study did not specifically focus on whiplash injury, it provides indication that addressing PTSD symptoms in the chronic stage of WAD may allow for a decrease in levels of pain thus facilitating the potential effects of more pain/disability focused approaches to management such as exercise and pain-focused CBT. Based on our findings of the co-occurrence of PTSD and WAD, we conducted a small pilot study with the aim being to test the effects of trauma-focused CBT on psychological factors, pain and disability in individuals with chronic WAD . Twenty-six participants with chronic WAD and a diagnosis of PTSD were randomly assigned to treatment (n = 13) or no-Intervention (n = 13) control. The treatment group underwent 10 weekly sessions of trauma-focused CBT for PTSD. Assessments of PTSD diagnosis, psychological symptoms, disability, and pain symptoms were made at baseline and post-assessment (10-12 weeks). Following the treatment intervention, there was not only a significant reduction in psychological symptoms (PTSD symptom severity; numbers meeting the diagnostic criteria for PTSD; depression, anxiety and stress scores) but also a significant decrease in pain and disability and improvements in physical function, bodily pain and role physical items of the SF36 (Table 1). The results of this study indicate that trauma-focused CBT provided to individuals with chronic WAD has positive effects, not only on psychological status but also on pain and disability the cardinal symptoms of this condition. Whilst the mean change of 5% was marginal in terms of a clinical relevance , the effect size for change of the NDI was moderate (d=0.4) and shows promise for a greater effect in a larger sample size . Nevertheless our pilot trial findings suggest that trauma-focused CBT alone will not be enough for successful management of chronic WAD and for this reason our proposed trial will combine this approach with exercise. These findings are potentially ground breaking in the area of whiplash management and it is imperative that they are now tested in a full randomised controlled design. In summary, we have already shown that individuals with chronic WAD and moderate PTSD symptoms do not respond as well to a physical rehabilitation based intervention as those without PTSD symptoms . Our recent pilot study indicates that trauma-focused CBT has a beneficial effect on both psychological status and pain and disability. We propose that by pre-treating the PTSD, PTSD symptoms and pain related disability will decrease allowing the exercise intervention to be more effective than has been seen to date [24, 25]. Therefore our proposed research will address this identified gap in knowledge by being the first to evaluate the efficacy of a combined trauma-focused CBT intervention followed by exercise for chronic WAD. The primary aim of this project is to investigate the effectiveness of combined trauma-focused CBT and exercise to decrease pain and disability of individuals with chronic whiplash and PTSD. The secondary aims are to investigate the effectiveness of combined trauma-focused CBT and exercise to decrease posttraumatic stress symptoms, anxiety and depression, and to investigate the effectiveness of trauma-focused CBT alone on posttraumatic stress symptoms and pain/disability. This trial is expected to commence in June 2015 and completed by December 2018. 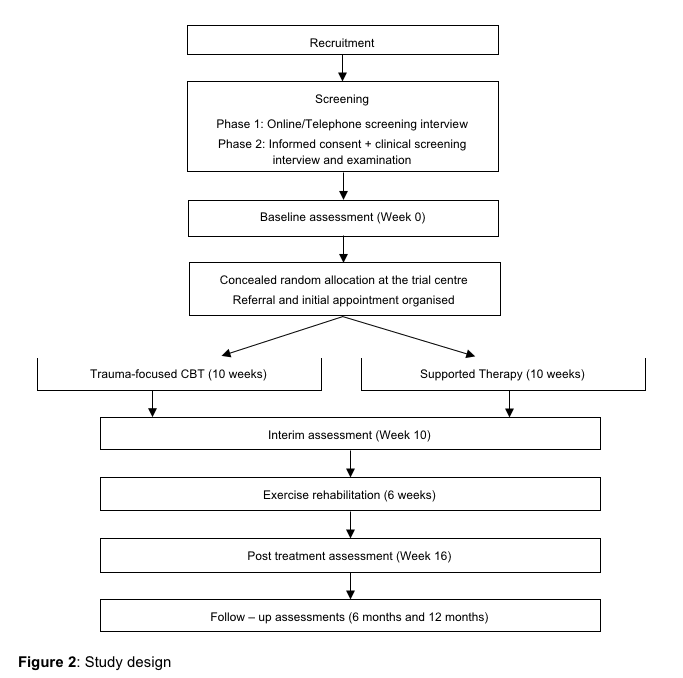 This study will be a randomised controlled multi-centre trial evaluating 10 weeks of trauma-focused CBT compared with 10 weeks of supported therapy, each followed by a 6 week exercise program. Outcomes will be measured at 10 weeks, 16 weeks, 6 and 12 months post randomisation. A total of 108 people with chronic whiplash disorder (>3 months, <5 years duration) and PTSD (DSM-5 diagnosed with CAPS) will be enrolled in the study. The assessors measuring outcomes will be blinded to the assigned treatment group allocation. The protocol conforms to CONSORT guidelines. 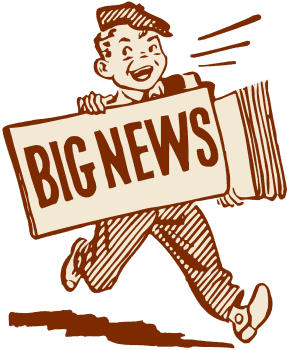 Advertisements (the Danish national health register, newspaper, newsletter and internet): potential participants will be invited to make contact with project staff. Physiotherapy and General Medical Practices: the study will be promoted in physiotherapy and medical clinics where project staff already have a relationship. Patients deemed to be appropriate for inclusion will be given an information sheet about the project and invited to contact project staff directly. There is a two-step process to determining inclusion to this study: initial online/telephone interview followed by a screening clinical examination. The initial interview will identify duration of whiplash injury (inclusion criteria) and moderate pain based on NDI scores, and potential exclusion criteria. Likelihood of PTSD will be based on conservative PCL-5 scores, requiring at least one moderate score per symptom and a minimum score of 30 overall. A description of the project will be provided to all volunteers at the point of initial contact. Volunteers deemed likely to be eligible will be invited to attend a screening clinical examination. If more than four weeks passes between the phone interview and clinical screening than the NDI and PCL-5 measures are to be re-administered. Prior to undertaking the screening clinical examination, volunteers will be provided with participant information and asked to complete informed consent documentation. During the screening examination, participants who have significant co-morbidity such as serious spinal pathology will be identified and excluded from participation. To screen for serious pathology, a diagnostic triage will be conducted following the Motor Accident Authority of NSW Whiplash Guidelines . The screening examination will also include a clinical interview by a research assistant who will administer the Clinician Administered PTSD scale 5 (CAPS 5) to determine the presence and severity of PTSD . The research assistant will also confirm the absence of exclusion criteria such as past history or current presentation of psychosis, bipolar disorder, organic brain disorder and severe depression substance abuse. If participants report a diagnosis of an exclusion criteria the relevant section of SCID-I will be utilised to clarify diagnosis. A history or current presentation of psychosis, bipolar disorder, organic brain disorder or severe depression. We are interested in detecting a clinically important difference between the two interventions, given that baseline values for each group are statistically equivalent as a result of the randomisation. Based on a two-sided t-test a sample of 86 (43 per group) will provide 80% power to detect a significant difference at alpha 0.05 between the group means of 10 points on the 100 point NDI (assuming a SD of 16, based on our pilot data and data from recent trials ). Effects smaller than this are unlikely to be considered clinically worthwhile. Allowing for a 20% loss to follow up by 12 months, we would require 54 participants per treatment group. Participants will be randomly allocated to treatment group. The randomisation schedule will be generated by the study biostatistician. Randomisation will be by random permuted blocks of 4 to 8. Consecutively numbered, sealed, opaque envelopes will be used to conceal randomisation. Group allocation will be performed immediately following completion of baseline measures by an independent (non-blinded) research assistant . 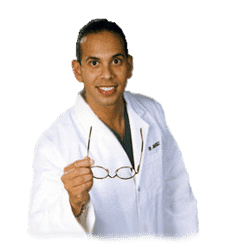 This same research assistant will arrange all appointment times with the treating practitioners and the blinded assessor for all outcome measures. Participants will be instructed not to reveal details about their treatment to the examiner in order to assist with blinding. Patients will be scheduled to receive their first treatment within one week of randomisation. A psychological intervention that targets PTSD symptoms will consist of 10 weekly 60-90 minute sessions of individually delivered trauma-focused CBT based on the Australian Guidelines for the treatment of Adults with Acute Stress Disorder and PTSD  (see Table 2). Session one will focus on providing psycho-education regarding the common symptoms of PTSD, maintaining factors and providing a rationale for various treatment components. Sessions two and three will continue to develop patient’s knowledge of PTSD symptoms and teach anxiety management strategies including deep breathing and progressive muscle relaxation. Cognitive restructuring which involves challenging unhelpful and irrational thoughts and beliefs will commence in session three and continue throughout treatment. Participants will start prolonged exposure in session four which will be paired with relaxation and cognitive challenging. Session six will introduce graded in-vivo exposure. Relapse prevention will also be included in the final two sessions . Participants will be asked to complete a home practice over the course of their sessions which will be recorded and brought to the next session. Treatment will be delivered by registered psychologists with postgraduate clinical training and experience delivering trauma-focused CBT interventions. The first session will involve education about trauma and an explanation of the nature of supportive therapy. The following sessions will include discussions of current problems and general problem-solving skills. Home practice will involve diary keeping of current problems and mood states. Supportive therapy will specifically avoid exposure, cognitive restructuring or anxiety management techniques. If the results of the trial are favourable and participants randomised to this intervention still have a PTSD diagnosis at the 12 month follow-up, they will be offered a referral to a clinical psychologist. Following the 10 week psychological therapy sessions (intervention or control), All participants will participate in the same exercise program. The 6-week exercise program will be carried out under supervision from a physiotherapist (2 sessions in each of the first four weeks; and 1 session in week 5 and week 6) and will comprise specific exercises to improve the movement and control of the neck and shoulder girdles as well as proprioceptive and co-ordination exercises (see Table 3). The exercises will be tailored by the physiotherapist for each individual participant. The program begins with a clinical examination of the cervical muscles and the axio-scapular-girdle muscles and includes tests that assess ability to recruit the muscles in a coordinated manner, tests of balance, cervical kinaesthesia and eye movement control and tests of muscle endurance at low levels of maximum voluntary contraction. The specific impairments that are identified are then addressed with an exercise program that is supervised and progressed by the physiotherapist. This specific treatment program has been described in detail  and focuses on activating and improving the co-ordination and endurance capacity of the neck flexor, extensor and scapular muscles in specific exercises and functional tasks, and a graded program directed to the postural control system, including balance exercises, head relocation exercises and exercises for eye movement control. Participants will also perform the exercises at home, once a day. A log book will be completed by participants to record compliance with the exercises. At the same time, the physiotherapist will guide the subject’s return to normal activities. Physiotherapists will adhere to cognitive-behavioural principles during training and supervision of all exercises . The cognitive behavioural therapy principles include the encouragement of skill acquisition by modelling, setting progressive goals, self-monitoring of progress, and positive reinforcement of progress. Self-reliance will be fostered by encouraging subjects to engage in problem-solving to deal with difficulties rather than seeking reassurance and advice, by encouraging relevant and realistic activity goals, and by encouraging self-reinforcement. Daily physical activity at home will be encouraged and monitored using a diary. Written and illustrated exercise instructions will be provided. At the baseline assessment, personal characteristics such as age, gender, level of education, compensation status, accident date and information about symptoms of whiplash will be collected. The following outcome measures will be assessed by a blind assessor at baseline, 10 weeks, 16 weeks, 6 months and 12 months post randomisation. The Neck Disability Index (NDI) will be the primary outcome measure . The NDI is a valid measure and reliable measure of neck pain related disability  and is recommended for use by the Bone and Joint Decade Neck Pain Task Force  and at the recent International Whiplash Summit [11, 16]. Clinician administered PTSD scale 5 (CAPS 5) . Expectations of a beneficial treatment effect will be measured with the Credibility Expectancy Questionnaire (CEQ)  at the first and last week of each treatment. Working alliance as reported by the client and the therapist (psych or physio) will also be measured at the first and last week of each treatment using the Working Alliance Inventory (WAI) . Treatment sites will be located in areas easily accessible by public transport. 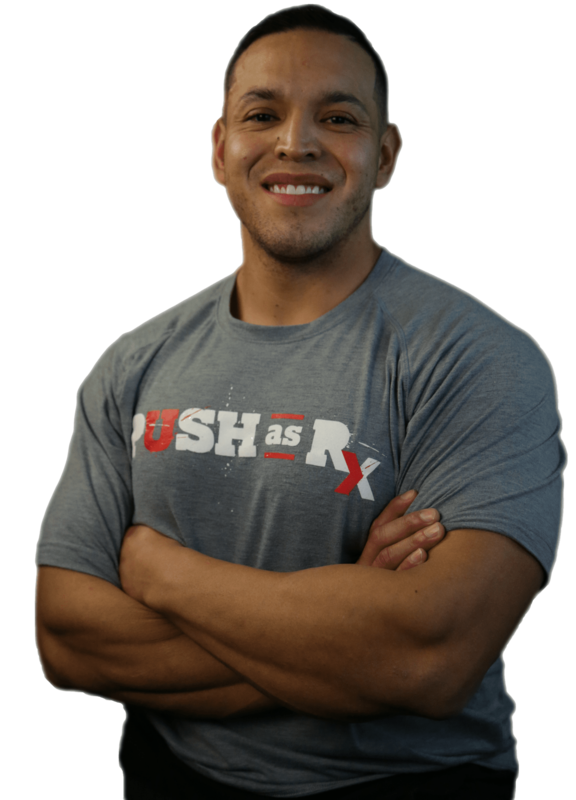 Attempts will be made to have both the psychology and exercise sessions held at the same site. Prior to commencement of the trial, psychologists and physiotherapists at each treatment site will be provided with the appropriate therapist protocol. Psychologists will be trained to implement the CBT program and the supported therapy by senior investigators at a one day workshops. Physiotherapists will be trained by senior investigators to implement the exercise program at a one day workshop. Prior to starting the trial, the different treatment provider sites and therapists will be provided with a copy of the trial and treatment protocols. Both psychological therapies will be conducted according to a procedural manual. Therapists will be required to record each session as well as complete a checklist of adherence to the protocol. A random sample of these recordings and checklists will be evaluated and ongoing supervision provided by a psychologist on the research team. Physiotherapy exercises will be based on a previous exercise trial for chronic WAD . An audit of the physiotherapy sessions will be conducted twice during the intervention by a senior investigator expert in this area. A handover will occur between psychologist and physiotherapist to maintain continuity of care. Apart from the usual ethics committee based provisions for reporting of adverse effects, practitioners will be requested to report any adverse event to the Chief Investigators. Also at the 16 week follow-up, information about adverse effects of treatment will be sought from all subjects using open-ended questioning. At 6 and 12 months follow-up, data relating to the number of recurrences of neck pain, and the number of health care contacts will also be collected. The study biostatistician will analyse the data in a blinded manner. All analyses will be conducted on an intention to treat basis. The primary and secondary outcomes measured at 10 weeks, 16 weeks, 6 months, and 12 months will be analysed using linear mixed and logistic regression models that will include their respective baseline scores as a covariate, subjects as a random effect and treatment conditions as fixed factors. Diagnostics will be used to examine assumptions, including homogeneity of variances. Effect sizes will be calculated for all measures with an effect size of 0.2 considered small, 0.5 medium and 0.8 large. Alpha will be set at 0.05. Any effect of site (Qld or Denmark) will be evaluated by including a site-by-treatment group-by-time interaction term to the mixed models analyses. Effect modification will only be assessed for the primary outcome of NDI. The trial is funded by a NHMRC Project grant 1059310. This project addresses a problem of major importance to human health. Whiplash is an enormous health burden for both Australia and all countries where there are motor vehicles. Current conservative approaches to the management of chronic WAD have been shown to be only marginally effective. One reason for this may be due to the lack of attention of current practice to the psychological status of whiplash injured patients. This study will provide a definitive evaluation of the effects of adding trauma-focused CBT to exercise for individuals with chronic WAD and PTSD. This study is likely to influence the clinical management of whiplash injury and will have immediate clinical applicability. Any intervention that may improve health outcomes for individuals with chronic whiplash will have far reaching effects in both Australia and internationally. Our study will also have implications for both health and insurance policy makers in their decision making regarding treatment options and funding. A search of the WHO International Clinical Trials Registry Platform Search Portal on 2/3/13 revealed no planned or completed trial that would duplicate our work. It is widely accepted that psychosocial factors are related to illness behaviour and there is some evidence that they may influence the rate of recovery from post-traumatic disorders. The abilities of psychosocial stress, somatic symptoms, and subjectively assessed cognitive impairment to predict delayed recovery from common whiplash were investigated in a follow-up study. 78 consecutive patients referred 7.2 (SD 4.5) days after they had sustained common whiplash in car accidents were assessed for psychosocial stress, negative affectivity, personality traits, somatic complaints, and cognitive impairment by semistructured interview and by several standardised tests. On examination 6 months later 57 patients were fully recovered and 21 had persisting symptoms. The groups’ scores for the independent variables assessed at the baseline examination were compared. Stepwise regression analysis showed that psychosocial factors, negative affectivity, and personality traits were not significant in predicting the outcome. However, initial neck pain intensity, injury-related cognitive impairment, and age were significant factors predicting illness behaviour. This study, which was based on a random sample and which considered many other possible predictive factors as well as psychosocial status, does not support previous findings that psychosocial factors predict illness behaviour in post-trauma patients. Being involved in an automobile accident can be a traumatic experience for anyone. From physical injuries and financial problems, to emotional distress, an auto accident can place a heavy burden on those individuals who’ve experienced it, especially if the auto accident injuries begin to take a toll on the mind. Many patients visit my chiropractic office with anxiety, irrational fears, depression and PTSD after being involved in an automobile accident. Learning to trust again to receive chiropractic care can be challenging, but through careful and effective spinal adjustments and manual manipulations, our staff can provide patients with the sense of safety they need to continue treatment and achieve overall health and wellness. In conclusion, automobile accidents can cause a variety of physical injuries and conditions, such as whiplash, back pain and headaches, as well as financial issues, however, auto accident injuries and complications can also lead to emotional distress. According to evidence-based research studies, like the one above, emotional distress has been connected to chronic pain symptoms. Fortunately, researchers have conducted numerous research studies to demonstrate how mindfulness interventions, like chiropractic care, can help reduce emotional distress and improve painful symptoms. Information referenced from the National Center for Biotechnology Information (NCBI). The scope of our information is limited to chiropractic as well as to spinal injuries and conditions. To discuss the subject matter, please feel free to ask Dr. Jimenez or contact us at 915-850-0900 . 1. Sterling, M., G. Jull, and J. Kenardy, Physical and psychological factors maintain long-term predictive capacity post-whiplash injury. Pain, 2006. 122(1-2): p. 102-108. 2. Carroll, L.J.P., et al., Course and Prognostic Factors for Neck Pain in the General Population: Results of the Bone and Joint Decade 2000-2010 Task Force on Neck Pain and Its Associated Disorders. Spine, 2008. 33(4S)(Supplement): p. S75-S82. 3. Rebbeck, T., et al., A prospective cohort study of health outcomes following whiplash associated disorders in an Australian population. Injury Prevention, 2006. 12(2): p. 93-98. 4. Sterling, M., J. Hendrikz, and J. Kenardy, Compensation claim lodgement and health outcome developmental trajectories following whiplash injury: A prospective study. PAIN, 2010. 150(1): p. 22-28. 5. MAYOU, R. and B. BRYANT, Psychiatry of whiplash neck injury. The British Journal of Psychiatry, 2002. 180(5): p. 441-448. 6. Kenardy, J., et al., Adults’ adjustment to minor and moderate injuries following road traffic crashes: Wave 1 findings., in Report to MAIC QLD. 2011. 7. MAIC, Annual Report 2009-2010. 2010: Brisbane. 8. Connelly, L.B. and R. Supangan, The economic costs of road traffic crashes: Australia, states and territories. Accident Analysis & Prevention, 2006. 38(6): p. 1087-1093. 9. Littleton, S.M., et al., The association of compensation on longer term health status for people with musculoskeletal injuries following road traffic crashes: Emergency department inception cohort study. Injury, 2011. 42(9): p. 927-933. 10. Schmidt, D., Whiplash koster kassen. Livtag, 2012. 1. 11. Siegmund, G.P., et al., The Anatomy and Biomechanics of Acute and Chronic Whiplash Injury. Traffic Injury Prevention, 2009. 10(2): p. 101-112. 12. Börsbo, B., M. Peolsson, and B. Gerdle, The complex interplay between pain intensity, depression, anxiety and catastrophising with respect to quality of life and disability. Disability and Rehabilitation, 2009. 31(19): p. 1605-1613. 13. Sterling, M., et al., Physical and psychological factors predict outcome following whiplash injury. Pain, 2005. 114(1-2): p. 141-148. 14. Schmitt, M.A.M.M.T., et al., Patients with Chronic Whiplash-Associated Disorders: Relationship Between Clinical and Psychological Factors and Functional Health Status. American Journal of Physical Medicine & Rehabilitation, 2009. 88(3): p. 231-238. 15. Sullivan, M.J.L., et al., Catastrophizing, pain, and disability in patients with soft-tissue injuries. Pain, 1998. 77(3): p. 253-260. 16. Nederhand, M.J., et al., Predictive value of fear avoidance in developing chronic neck pain disability: consequences for clinical decision making. Archives of Physical Medicine and Rehabilitation, 2004. 85(3): p. 496-501. 17. Bunketorp-Kall, L.S., C. Andersson, and B. Asker, The impact of subacute whiplash-associated disorders on functional self-efficacy: a cohort study. International Journal of Rehabilitation Research, 2007. 30(3): p. 221-226. 18. Buitenhuis, J., et al., Relationship between posttraumatic stress disorder symptoms and the course of whiplash complaints. Journal of Psychosomatic Research, 2006. 61(5): p. 681-689. 19. Sterling, M. and J. Kenardy, The relationship between sensory and sympathetic nervous system changes and posttraumatic stress reaction following whiplash injury—a prospective study. Journal of Psychosomatic Research, 2006. 60(4): p. 387-393. 20. Sullivan, M.J.L., et al., Pain, perceived injustice and the persistence of post-traumatic stress symptoms during the course of rehabilitation for whiplash injuries. PAIN, 2009. 145(3): p. 325-331. 21. Sterling, M., et al., The development of psychological changes following whiplash injury. Pain, 2003. 106(3): p. 481-489. 22. O’Donnell, M.L., et al., Posttraumatic disorders following injury: an empirical and methodological review. Clinical Psychology Review, 2003. 23(4): p. 587-603. 23. Teasell, R., et al., A research synthesis of therapeutic interventions for whiplash-associated disorder (WAD): Part 4 – noninvasive interventions for chronic WAD. Pain Research & Management, 2010. 15(5): p. 313 – 322. 24. Stewart, M.J., et al., Randomized controlled trial of exercise for chronic whiplash-associated disorders. Pain, 2007. 128(1–2): p. 59-68. 25. Jull, G., et al., Does the presence of sensory hypersensitivity influence outcomes of physical rehabilitation for chronic whiplash? – A preliminary RCT. Pain, 2007. 129(1–2): p. 28-34. 26. Söderlund, A. and P. Lindberg, Cognitive behavioural components in physiotherapy management of chronic whiplash associated disorders (WAD) – a randomised group study. Physiotherapy Theory and Practice, 2001. 17(4): p. 229-238. 27. Wicksell, R.K., et al., Can Exposure and Acceptance Strategies Improve Functioning and Life Satisfaction in People with Chronic Pain and Whiplash‐Associated Disorders (WAD)? A Randomized Controlled Trial. Cognitive Behaviour Therapy, 2008. 37(3): p. 169-182. 28. Ostelo, R.W., et al., Behavioural treatment for chronic low-back pain. Cochrane Database Syst Rev, 2005. 1(1). 29. BISSON, J.I., et al., Psychological treatments for chronic post-traumatic stress disorder: Systematic review and meta-analysis. The British Journal of Psychiatry, 2007. 190(2): p. 97-104. 30. NHMRC, Australian Guidelines for the Treatment of Adults with ASD and PTSD. 2007: Canberra. 31. Jenewein, J., et al., Mutual influence of posttraumatic stress disorder symptoms and chronic pain among injured accident survivors: A longitudinal study. Journal of Traumatic Stress, 2009. 22(6): p. 540-548. 32. Dunne, R.L.P., J.P.F. Kenardy, and M.P.M.B.G.D.M.P.F. Sterling, A Randomized Controlled Trial of Cognitive-behavioral Therapy for the Treatment of PTSD in the Context of Chronic Whiplash. Clinical Journal of Pain November/December, 2012. 28(9): p. 755-765. 33. Macdermid, J., et al., Measurement Properties of the Neck Disability Index: A Systematic Review. Journal of Orthopaedic & Sports Physical Therapy, 2009. 39(5): p. 400-C12. 34. Arnold, D.M.M.D.M., et al., The design and interpretation of pilot trials in clinical research in critical care. Critical Care Medicine Improving Clinical Trials in the Critically Ill: Proceedings of a Roundtable Conference in Brussels, Belgium, March 2008, 2009. 37(1): p. S69-S74. 35. MAA. Guidelines for the management of whiplash associated disorders. 2007; Available from: www.maa.nsw.gov.au. 36. Weathers, F.W., et al. The Clinician-Administered PTSD Scale for DSM-5 (CAPS-5). Interview available from the National Center for PTSD. 2013; Available from: www.ptsd.va.gov. 37. Spitzer, W., et al., Scientific Monograph of Quebec Task Force on Whiplash Associated Disorders: redefining “Whiplash” and its management. Spine, 1995. 20(8S): p. 1-73. 38. ACPMH, Australian guidelines for the treatment of adults with acute stress disorder and post-traumatic stress disorder. 2007, Melbourne, VIC: Australian Centre for Posttraumatic Mental Health. 39. Pengel, L.H.M.M., K.M.P. Refshauge, and C.G.P. Maher, Responsiveness of Pain, Disability, and Physical Impairment Outcomes in Patients With Low Back Pain. Spine, 2004. 29(8): p. 879-883. 40. Weathers, F.W., T.M. Keane, and J.R.T. Davidson, Clinician-administered PTSD scale: A review of the first ten years of research. Depression and Anxiety, 2001. 13(3): p. 132-156. 41. Weathers, F., et al., The PTSD Checklist for DSM-5 (PCL-5). Scale available from the National Center for PTSD. www. ptsd. va. gov, 2013. 42. Lovibond, S. and P. Lovibond, Manual for the Depression Anxiety Stress Scales. 2nd ed. 1995, Sydney: Psychological Foundation. 44. Westaway, M., P. Stratford, and J. Binkley, The Patient-Specific Functional Scale: Validation of Its Use in Persons With Neck Dysfunction. Journal of Orthopaedic & Sports Physical Therapy, 1998. 27(5): p. 331-338. 45. Sullivan, M.J.L., S.R. Bishop, and J. Pivik, The Pain Catastrophizing Scale: Development and validation. Psychological Assessment, 1995. 7(4): p. 524-532. 46. Nicholas, M.K., The pain self-efficacy questionnaire: Taking pain into account. European Journal of Pain, 2007. 11(2): p. 153-163. 47. Miller, R., S. Kori, and D. Todd, The Tampa Scale for Kinesiophobia. Tampa, FL. Unpublished report, 1991. 48. Devilly, G.J. and T.D. Borkovec, Psychometric properties of the credibility/expectancy questionnaire. Journal of Behavior Therapy and Experimental Psychiatry, 2000. 31(2): p. 73-86. 49. Horvath, A.O. and L.S. Greenberg, Development and validation of the Working Alliance Inventory. Journal of Counseling Psychology, 1989. 36(2): p. 223-233.